How to Sell a Home – 4 Key Factors FREE CLASS! How do I get the best price when I sell my home? We hear this question every day. If you are considering selling your home in 2018, you don’t want to miss this FREE CLASS, offered in Hudson, WI & Woodbury, MN! We have found there are 4 key factors that are often overlooked by sellers when putting a home on the market. Failure to address any of those 4 key factors often results in the home not selling or the home selling for significantly less after sitting on market for an extended period. But the real estate market in the Twin Cities has turned around, so my house should be easy to sell, right? Not necessarily. The market has indeed improved, but there are still many sellers with homes that linger on the market while other homes in their neighborhood are selling. Buyers have changed in the past 10 years. Their expectations are high, and they have clear ideas about what they want in a home. As a seller, you want to ensure your home’s listing stands out. Selling Your Home – 4 Key Factors will address the obstacles home sellers face when listing a home for sale. We will show you how to maximize your home selling experience to achieve the best price and terms. If you were previously unsuccessful in selling your home, this class will reveal how to obtain better results when you list your home in 2018. Saturday, March 3rd, 9:30 a. m.
Tuesday, March 6th, 6:30 p. m.
Thursday, March 1st, 6:30 p. m.
Thursday, March 8th, 6:30 p. m.
Becky Durham is an Accredited Staging Professional® and offers her staging services to all her listing clients. Becky is also a certified Seniors Real Estate Specialist® with advanced training and experience to offer compassionate and dedicated service to seniors and their families as they transition to senior housing options. Becky is a licensed REALTOR® in MN & WI. John and Becky are also experienced educators. Both possess Bachelor of Science degrees in Education, and continued their education to receive their Master’s degrees. Becky worked in higher education for many years while John worked as an executive and trainer in business and industry prior to entering the field of residential real estate. They love to work with home buyers and sellers in all price points and stages of life, from first time home buyers to downsizing baby boomers and seniors. 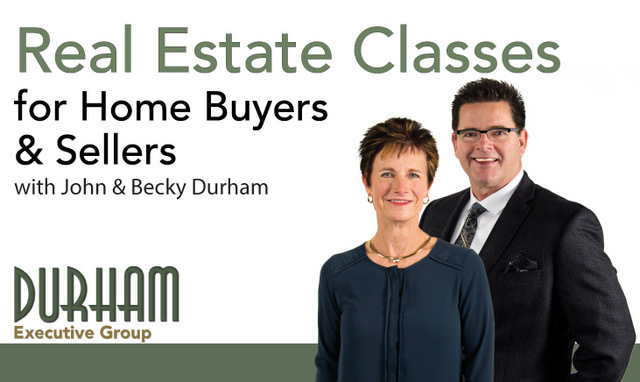 John and Becky enjoy serving the community by offering their real estate expertise in the form of these FREE home buying and selling classes. "When we choose John and Becky Durham we knew they were knowledgeable and experienced Woodbury real estate agents. However, what we didn’t know was just how personable and friendly the two of them... continued"